Yankee Candles, are one of my FAVORITES to have in the house and to give as gifts. Its time to pull out the Summer Candles and bring the smell into the home~ From now through August 3rd, you can score Buy two get one FREE Yankee Candles with this printable coupon. I LOVE Yankee Candles but will ONLY BUY them when I have a coupon or its a CLEARANCE sale. In addition, there's a NEW $10 off Yankee Candle Coupon. Oh yea! 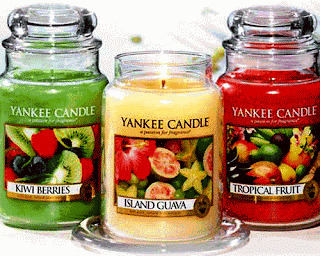 Hurry and snag the $10 off Yankee Candle Purchase of $25 or more. What's your favorite Summer Scent?? I LOVE the fruity smells. Head to your local Yankee Candle to put this Buy Two get one FREE Yankee Candle coupon into action. * Please note that the coupon expires on August 3rd.